The Golden Technologies Comforter Jr. Petite is the most comfortable, popular, and most reliable seat lift recliner available today. Featuring luxury chaise lounge padding, the patented "Morley Torsioned Spring System", and the Golden Lifetime Warranty. Golden Technologies is the only manufacturer with a lifetime warranty on three major components (Scissor Mechanism, Wooden Frame, and Lift Chair Mechanism). The "Comforter Jr. Petite" is designed for those 5'0" or under. Equipped with the "Morley Torsioned Spring System", and the Golden Lifetime Warranty. Golden Technologies is the only manufacturer with a lifetime warranty on three major components (Scissor Mechanism, Wooden Frame, and Lift Chair Mechanism). The PR-501 L is designed for those 5'11" to 6'2". Over All Width of 34.5"
Over All Height of 44"
Seat To Top of Back Height is 28.5"
Width Between Arms of 23"
Floor to Top of Seat Height is 20.5"
Featuring luxury chaise lounge padding, the patented "Morley Torsioned Spring System", for exceptional comfortability and the Golden Lifetime Warranty for lifetime support. Golden Technologies is the only manufacturer with a lifetime warranty on three major components: Scissor Mechanism, Wooden Frame, and Lift Chair Mechanism. The "Comforter Medium" is designed for those 5'4" to 5'10". Over All Width of 32.5"
Over All Height of 42"
Seat To Top of Back Height is 27"
Width Between Arms of 21"
Floor to Top of Seat Height is 19.5"
THe PR-501S is made more comfortable with the "Morley Torsioned Spring System", and guaranteed with the Golden Lifetime Warranty. Golden Technologies is the only manufacturer with a lifetime warranty on three major components (Scissor Mechanism, Wooden Frame, and Lift Chair Mechanism). The "Comforter Small" is designed for those 5'0" to 5'3". Seat To Top of Back Height is 26"
Width Between Arms of 20"
Floor to top of Seat: 22.5"
The PR-501 T Golden Technologies offers a 3 year warranty on the Scissor Mechanism, Wooden Frame, and Lift Chair Mechanism. The "Comforter Tall" is designed for those 6'3" to 6'8". Over All Height of 47"
Seat To Top of Back Height is 30"
Floor to Top of Seat Height of 22.5"
The Largest lift chair on the market! If bigger is better then this is the best. The Golden Technologies PR502 Comforter is Tall and Extra Wide with 3 Motors. With a Seat Width of 33" Inches and a 700 Pound Weight Capacity this is the most comfortable Lift Chair available in this size. Seat To Top of Back Height is 29"
Over All Width of 45"
Width Between Arms of 33"
Floor to Top of Seat Height of 21"
PR502 lift chair is custome made. There are no returns on this lift chair! Suggested Height for use 5'11" to 6'2"
The Golden Technologies MaxiComfort introduces a new concept in seating comfort. The MaxiComfort allows for a maximum range in positioning at the touch of a button which improves circulation, controls pressure and enhances comfort. The trendelenburg reclining capabilities makes the MaxiComfort the most comfortable, popular, and most reliable seat lift recliner available today. Featuring luxury chaise lounge padding, the patented "Morley Torsioned Spring System", and the Golden Lifetime Warranty. Golden Technologies is the only manufacturer with a lifetime warranty on three major components (Scissor Mechanism, Wooden Frame, and Lift Chair Mechanism). Suggested Height for use 5'4" to 5'10"
Suggested Height for use 5'0" to 5'3"
The Pride CL-30 lift chair is a 3 position lift chair with blown fiber and a split back, a megamat ultra motor, engineered furniture and laminate/hardwood frame. -Patented, Quiet and smooth lift system. Comfort and style complement one another perfectly in Pride's Gentle Line Lift Chairs. With an array of plush fabrics to fit any d�cor and a superior design that provides exceptional strength, Gentle Line chairs deliver style and durability that will last for years to come. Plus, Pride's Gentle Line offers numerous standard features, incredible comfort, and quiet and smooth performance, all at a great value. 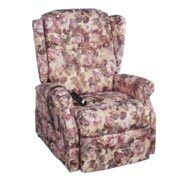 Pride� Luxury Recliners are designed to be the ultimate in lift chair comfort, style and performance. The state-of-the-art lift system utilized in Pride Luxury Lift Chairs will recline you further back than any other lift chair, providing wonderful sleeping relaxation. This elegant tufted contemporary wing back recliner is truly a classic. Its traditional design provides ultimate comfort and support with a plush padded chaise pad and contoured wings.